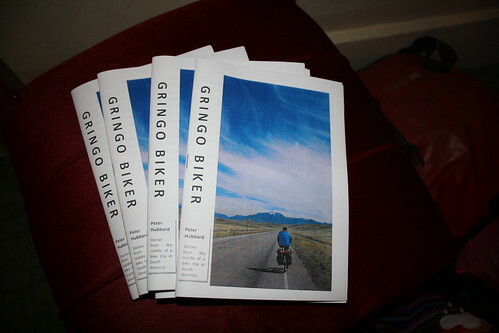 I am probably working away on a farm at the moment but I have written a few posts to keep regular readers amused...Next up, Gringo Biker. Well, the name is a bit naff, but I wanted something that instantly explained what I was doing. Basically, my inspiration came from Heinz Stucke. This well-travelled cyclist has been on the road since 1962. 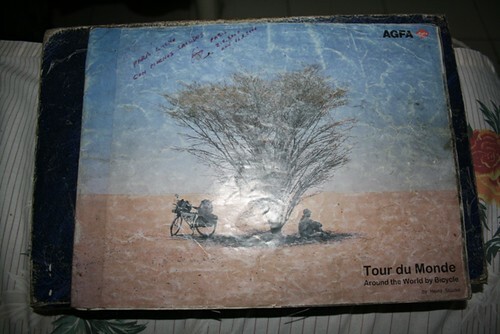 He now travels from the licencing revenue of over 100,000 travel photos and from sales of his booklet discribing his travels. Well, I decided to follow suit and bash out a little booklet of travel stories. I filchered most of them from previous posts on this blog. Then I copied them to word, ran a spell check, used Booklet Creator and made a front cover with one of Mike's photos of me. Then I printed off one master copy for 5 soles and had 30 copies photocopied for 30 soles. I sold each copy for 5 soles and had made back my investment in the first day by wandering around Miraflores in Lima and irritating anyone who looked like they might speak (and read) English. It is my first dabble with entrepreneurialism and was fun. Especially seeing those 30 fresh copies roll hot of the press. I am looking forward to making another one with a different set of stories and now I have learned a few important things about manufacturing. -Photocopying is cheaper than printing. -Print the master copy to highest standard possible. -Spell check and read through for mistakes. -Make sure the pages are in the right order. -Grab a few copies in a plastic bag and look for white people. -Someone on a bike is a safe bet. -People lingering at road crossings, cafe tables, queues and bus stations. -Mention it over breakfast in a hostel. I am probably working away on a farm at the moment but I have written a few posts to keep regular readers amused...Firstly, back to the Huayhuash trek in Peru. Halfway around the trek there are some hot springs where you can soak your aching legs. Dave and I got chatting to a trekking guide with one of the tour groups. He was sat in the hot bath drinking beer and smoking cigarettes. We had already been in and out, and eaten dinner, and sat, in all our warm clothes, on the edge. To start with we had asked him about his job, whether he was interested in moutain climbing or prefered trekking. He told us that he was keen on climbing but has a knee injury and finds trekking easier. The knee injury was from carrying a teacher downhill. She was accompanying a group of British children that he was guiding and started to show symptoms of oedema (a potentially life-threatening form of altitude sickness). He ran downhill for 4kms with her on his back. There was no phone reception of course but the group had a British Army emergency transponder with them. A message got through to London and from there to Huaraz. Anyway she survived and Eric got a sore knee. I asked Eric about the standard of mountain rescue in general and he was, to say the least, disparaging. Helicopters are theoretically available but they have to come from Lima. They won't even take off before insurance details have been sorted out. 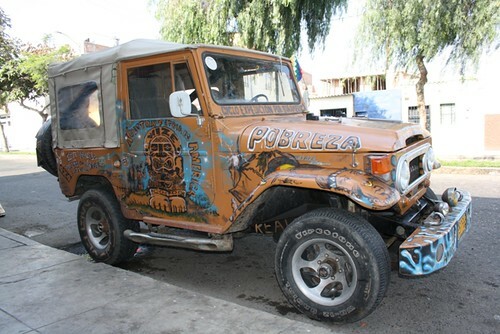 Eric didn't have much faith in Peru's government. The country has a wealth of mineral resources and is one of the world leaders in the production of stuff like arsenic, copper, lead, silver, tin and zinc. However, from Eric's point of view, there is no sign of this wealth benefiting the people. He thinks this is due to corruption in government. He sited the example of Alberto Fujimori, the president during the nineties. Fujimori was a university lecturer before being elected, with a modest income. He privatised many state-owned enterprises raising an estimated US$9 billion barely a fraction of which would ever benifit Peruvian people. Last year he was convicted of human rights abuses and corruption and has been sent to prison. So perhaps it is unsuprising that Eric considers politicians with a great deal of suspicion. The poverty gap is as bad as ever. Some people in the poorer areas of Cusco and Lima live on 2 or 3 soles a day. About 50 pence. Around 35% of the population live below the poverty line. Peru has a thriving tourist industry. But, yet again, most of the money dissappears. In Cusco, most of the bars, restuarants and hotels in the centre are foreign owned. There are many government schemes to encourage foreign investment. Perurail, which runs the trains to Machu Picchu, which is visited by over 850 million people each year, is owned by a British company. 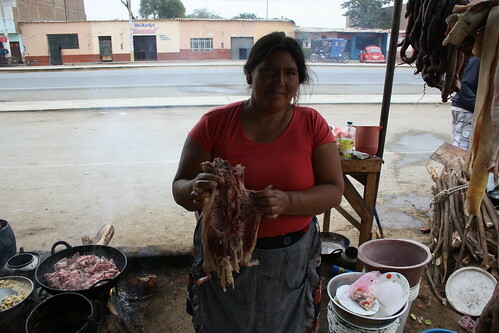 Eric said that Inca trail guides and cooks are fairly well-paid but porters can expect 120 soles for 4 days. About 7 pounds a day. The entrance fee at MP goes directly to Lima as do the entrance fees to the various National Parks in the country. Getting money back from Lima to invest in the tourism industry is like getting blood out of a stone. The Cordillera Huayhuash itself used to be a national park but the status was revoked. The area was used as a hideout by Shining Path untill that group was defeated in the early nineties. In 2002 two hikers were murdered in a robbery. Then, in 2004, another 4 hikers were shot whilst resisting an armed robbery, one died from blood-loss before rescue. The local police and government felt there was little they could do to police the area any better so instead they instigated a "protection money" system. As you pass by small communities on the trek you must pay between 10 and 35 soles, for which you get a receipt, in total you pay around 150 soles. The money goes toward "upkeep of the trail and to support local communities". This has made the area generally safe but infuriated the Israeli hikers we met. This year the tourism industry was dealt an additional blow with the flooding in Cusco. At the hight of the floods this year Peru was loosing US$1 million a day due to cancelations. The train to MP was suspended and helicopters were sent to rescue about 2000 stranded tourists and locals. The repair bill has been estimated to be around US$300 million. We finished our beers and went to bed. It was cold. We pitied those still enjoying the hot water because at some point they had to get out. 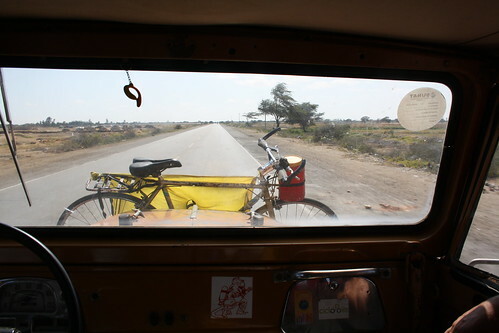 It was hot as I pedaled out of Piura and on towards the border. I made it to a little town called Las Lomas. In the morning I crossed the border into Ecuador. And almost at once the hills began. 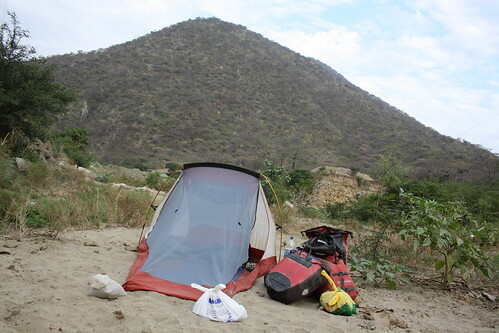 The first night I camped next to a river and was attacked by insects the minute I unzipped the tent to make tea. Pegs don't work very well in sand so I had to use plastic bags filled with sand. Then I had a day of uphill, I ran out of water and very thirsty I came across a gas station and chanced it and drank litres of water out of the tap (so far it hasn't made me ill). That night I reached a small village and asked if there was anywhere I could camp. 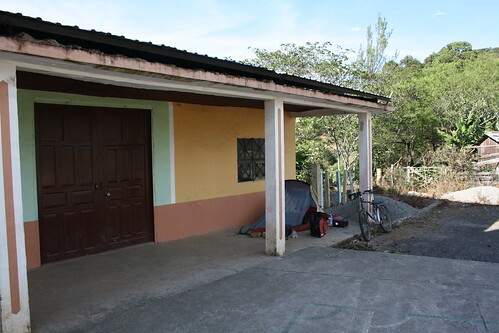 I was pointed towards the church and camped on the concrete veranda. The next day, fuelled by boiled eggs, I reached Loja. 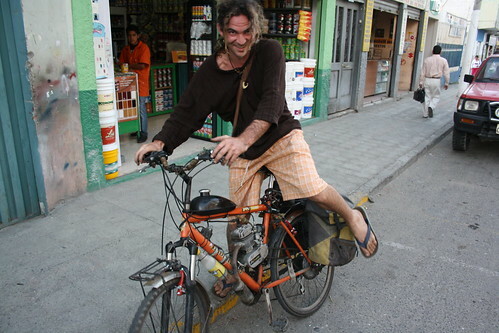 On my way into town I bumped into a French bloke on a motorised bicycle. A strange choice of transport I would say. Anyway he showed me a cheap hotel and we got some beers and drank them in a plaza. In the morning I headed down to Vilcabamba. It is hot here so quite refreshing when there is a rain shower. 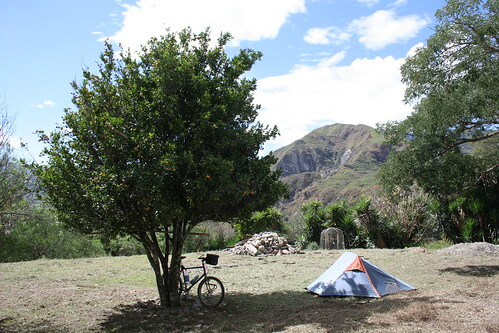 Found a campsite for $1 a night with a pool and camped under a lime tree. 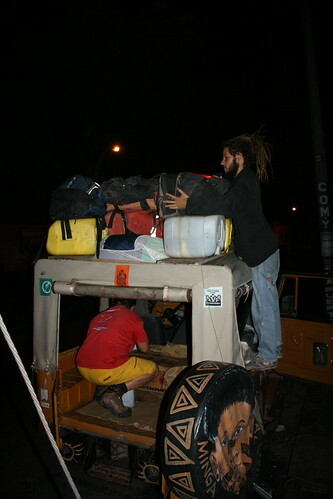 Dave Patton: Couchsurfer, CAACer, Roadtripper and Backpacker extraordinaire! After a few months on the road I discovered that a fellow CAACer was in hot pursuit. Dave, using buses, caught me up and he signed me up for a 9 day hike. He is a pretty nifty photographer and it is definately worth checking out his photos here. 1. We recently hiked the Huayhuash trek together. Where did you first hear about this trek? At one of the weekly Wednesday night Edinburgh couchsurfing group pub meets, a Scottish CSer who´d visited S America highly recommended the hike, saying it was far superior to the Santa Cruz hike. She wasn´t wrong, in my opinion! 2. Which was your favourite day of the trek? Day 3 - many stunning lakes and mountain vistas; difficult but very rewarding mountain pass with lots of surprises. At camp (Huayhuash village)... politely asking the locals who lived in a couple of mud brick houses for dinner to break the daily routine of spaghetti and pasta sauce. Result... wonderful cultural experience and insight into mountain life, and delicious homemade dinner and breakfast direct from the farm. Huayhuash? Top hike in the world. Why wash? Bar some hot springs, it´s the longest I´ve gone without washing and shaving! The post hike shower has never felt so good. I´ve had many great CSing experiences, such as Hawaian surfing and many road trips with the locals to places well off the tourist trail. But my favorite was probably my first, near Perth in Western Australia. My host lent me his bike and snorkel to visit Rottnest Island. He took me to one of his Aussie Rules football sessions so I could "give it a go". He welcomed me on a typical Aussie camping weekend with his pals in Margaret River, experiencing swags, fine wines and chocolate tasting. Plus a bedroom to myself in his family home and home cooking were delightful after months of hostels! 5. How many countries have you visited now? Which are your top 5? 46 I think, hope to make it to 100 one day! Top 5, tough question; I like to think of the top 5 places I´d most like to return to. New Zealand - for people who love the great outdoors. Thailand - beaches and tasty food at low prices. Bolivia - adventure travel in a nutshell and very cheap. South Africa - many natural delights and wild safari. Italy - it almost has it all; great history, cities, coast, mountains, lakes and food. 6. Can you recommend a book? Nelson Mandela´s autobiography, to learn what the great man has to say. 7. What is the most inspiring travel tale you have heard? I have probably been most inspired by an Australian fellow who hitch-hiked almost the length of Africa with another guy and girl. That was real adventure and getting off the beaten track, things that I strive for. One of the cool things about staying in the Casa de Ciclistas in Trujillo is getting to meet other cyclists. I was lucky enough with the selection on offer. 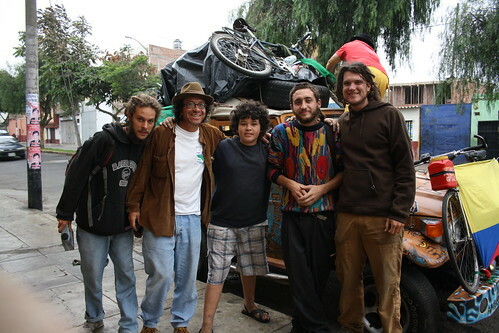 A pair of dreadlocked Argentinians and a trio of Columbians. Good practise for my Spanish. We cooked several meals together including several spicey rice dishes from the Columbians and a tradditional Arroz con Leche from the Rastas. Although, I still think rice pudding is a superior dish. One evening we all set off the University. I hadn't really understood why we were going but it turned out that David, one of the Columbians, was going to give a talk to some uni students about Hydrogen. Unusual choice of subject, I thought. Then, out of his bag, he produced a thing. The thing turned out to be for making hydrogen gas by electrolysis of water. Three hours of explanation in Spanish followed. The hard wooden stool I was sitting on didn't help. A few days later, in a conversation about a dangerous section of the road ahead, I discovered that David had a car. Funny sort of cyclist to have a car. But he was acting as a support driver for a large expedition of cyclists. Over 30 Columbians who were spread out over the route, a circumnavigation of the continent. He offered to give the Argentinians and me a lift past the dangerous bit. Sure, why not? That night I came back from looking around the town and saw it. I could see it was a car, but I thought to myself, that is a calamity. 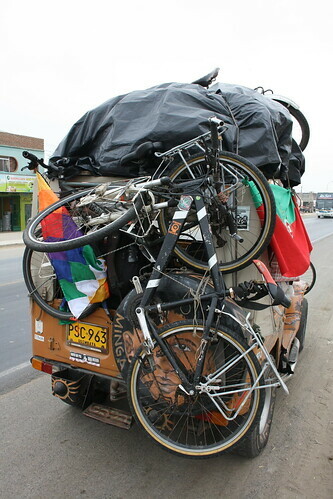 It was also a fairly small calamity considering it was going to carry six people, 4 bikes and a small mountian of gear. And the Columbians had a lot of gear. In pre-dawn darkness we began the task of lashing all the kit on. I went back to check if I had left anything and noticed a small orange glow above me. Sebastian was sat on the top step smoking a joint. 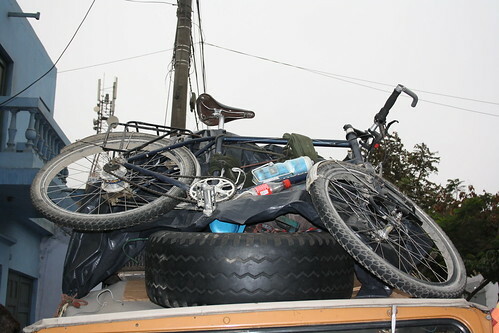 My bike was the last thing to be loaded on. A good choice as it wasn't crushed under a pile of other junk. A bad choice because all the ropes had been used up and I had to tie it on with a wet t-shirt. We finally all piled in. Easier said than done as the back door had been blocked up with lashed on bikes. We climbed through the windows negotiating the roll-bars with limbo-dancer agility. The back of the jeep was taken up by boxes of the Columbian's junk. The four of us were squashed together. As we lurched off it was obvious that Calamity was dangerously top-heavy. Everytime we hit a speed bump the four of us in the back were thrown around. There were no seats and not really enough room. Especially with Christian, Carlos' son. He is affectionately known as Gordito (the little fat one) and calls his dad Gordo. This is a very strange young man. Carlos is a stocky build but not really fat, at least not like his son. At twelve years old he has thighs that are bigger than mine. And it isn't down to cycling. 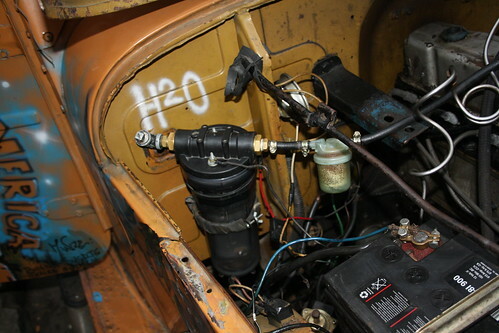 Calamity supposedly ran on hydrogen but in reality it ran on plain old petrol. Lots of it. David and Carlos had almost no money. So, at each petrol station we would all pile out and David would issue us with stacks of Columbian CD's and posters which we would try and sell to unsuspecting passers-by until we had made enough for the next tank-full. When we headed across the desert we filled up a large petrol canister which had to be squeezed in through the window, under the roll-bars, and gave us even less room. And it leaked. As we pressed on, wind rattling through the hunk-of-junk, Gordito sang loudly and tunelessly. Or, if he felt so inclined, he would imitate the noise of the engine. This could keep him entertained for hours. If we were unlucky enough to be overtaken by a police car then he would be singing "nee-nah" for the next 15 minutes. Sebastian had had enough and told him to sing out of the window. I began to suspect that there might be something amiss with Gordito. Perhaps some sort of hyperactive problem. Anyway, at this juncture, Andres took out his homemade pipe. I had seen him carve it out of the pip from a giant avocado a few days before. And started trying to light it in the windy squishy chaos. He wasn't having much success and threw each used match on the floor. Right next to the gasoline canister. I have never been more pleased to leave a vehicle in my life and seriously hope it will be a long time before I get in another car. But I guess better than being robbed by bandits. In Pirua we had a free bed in a fairly wierd place. A recreation facility for miners. There was a meeting going on to try to stop a new mine being built by a big company. But too much Spanish for me so I went and sat by the pool in the dark and listened to the radio. There was a free dinner too which was good. The Argentinians ate their fill and then went off to find a park somewhere to smoke. I went to bed. More exhausting than a day cycling. My favourite Peruvian dish is without a doubt Lomo Saltado. This hits the spot every time. It is kind of a beef stew with chips in it served with rice. 1. Fry the strips of beef. 2. Add the onion and tomatoes for 2 minutes. Another classic from Peru is Ceviche. This is a delicious lunchtime snack made from raw fish marinated in lemon juice. 1. Put fish in a bowl with crushed garlic and salt. Add lemon juice, finely sliced chili, pepper and chopped coriander. Leave for 10 minutes. 2. Slice oninons over the fish. 3. Serve with cooked corn, sweet potato and lettuce. Many meals in Peru are served with a simple onion salad. Just sliced up with a herb (parsley or coriander) or some lettuce and then drenched in lime juice. I quite like it. Also, a good snack often found sold on the street is Papa Rellena. This is mashed potato with some mince mixture, and olive and a bit of egg inside. Then fried. Another street snack is Anticuchos. These are kebabs of beef hearts. When you ask for one you get a roast potato on the end of the skewer.